I use this every single day... Game changer. I Love Dandyblend as a cold or warm nutmilk Â«Â LatteÂ Â» topped w cinnamon ! Love the fact it is caffeine-free and non-acidic. I use this everyday..lo e the 900g size bags! Tastes great. Love this product. It is the best coffee alternative that I have tried. This is a great substitute for coffee and also tastes really good as a cold beverage. Would highly recommend this product . I love black tea and was looking for a caffeine-free alternative to drink before bed. It's excellent! Doesnâ€™t taste like coffee, but it does satisfy coffee cravings. Works well for Â«Â latteÂ Â». You can add some cinnamon and cacao. I love Dandyblend!! I drink it every day, at least once, and I make sure I never run out. It's so good! And I love how it's instant, so it's super quick to make (hot or cold). I like mine with a bit of heavy cream. Just started on to my second bag. Went with the small one first, just in case I wasn't keen on it, and then bought the biggest one I could! It's delicious and a part of my day I look forward to. I just adore this stuff! Itâ€™s not strong & robust. Instead itâ€™s light with a hint of sweetness. Iâ€™ve always liked my coffee full on the dark side, but I really look forward to having this most mornings and every once in a while having a dark roast coffee. Would repurchase this again! dissolves perfectly in hot milk. I love it. Having to give my beloved coffee was very difficult for me and tea was just not cutting it. 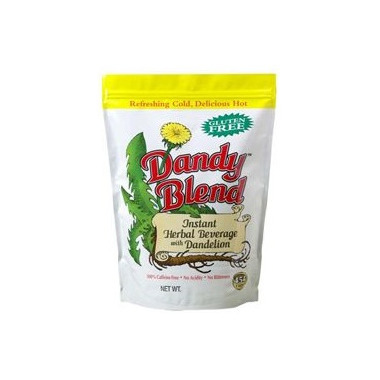 Dandy Blend was recommended to me as a coffee alternative so I decided to give it a shot. I have to say that is it a really great substitute, with a bold, deep flavour that I love. It doesn't exactly taste like coffee but it's a close second for me after having to eliminate coffee due to digestive issues. This is a healthy drink that tastes great too. My whole family drinks it. It's a bit pricey though. Great taste. Love it. Much better than similar beverages. This drink is awesome. I use it all the time. It taste close to coffee which is great for an alternative. I recommend it.